If it wasn’t for the fact that they’re all 8 light years away, I’d have to check my floor lamp. I swear I saw it moving! LOL! Man…you are just 100% percent awesome-sauce! Thanks Denver! ‘Cause that 80% awesome-sauce just isn’t as tasty. So, a Globulite is defined by its one exterior eyeball. Yeah, you just never know. I’ll have to ask our resident xenobiologist, Peanut, what she thinks. It’s hard to say what exactly constitutes a globulite when we only have Ellie’s observations to work from. Obviously “monocular” means having one eye, just as Stewart stated, but globulite could easily refer to them being globular and “lite (light)” for all we know. But they all seem to also have a similar body plan – kind of a jellyfish with a springy suction cup-like foot. The Cheesecake Cover one doesn’t *seem* to have a suction cup-like foot. But, it’s hard to say from this angle. It may be really, really tiny. I personally suspect it is in fact just very large and shallow, completely covering the bottom of the body. I’m more curious about the strange cheese-cake-shaped organ seen inside. Coincidence? Some sort of bait? An actual cheese cake in the process of being digested? This one must have driven Peanut, um, nuts. I hopped over here the other week from SpaceTrawler, and promptly read the entire archive. Fantastic stuff! If these monocular globulites were available to purchase in toy-like plastic forms, ideally with suction-cup foot-pads, I would snap them right up and stick them to my windows. Thanks Stewart! And if those globulites were available I’d totally sell ’em to you! Like a mattress-like life form! Love Douglas Adams. He left us way too early. or I could, if I got out my hot glue gun and some wiggly eyes. My room could suddenly have an infestation. 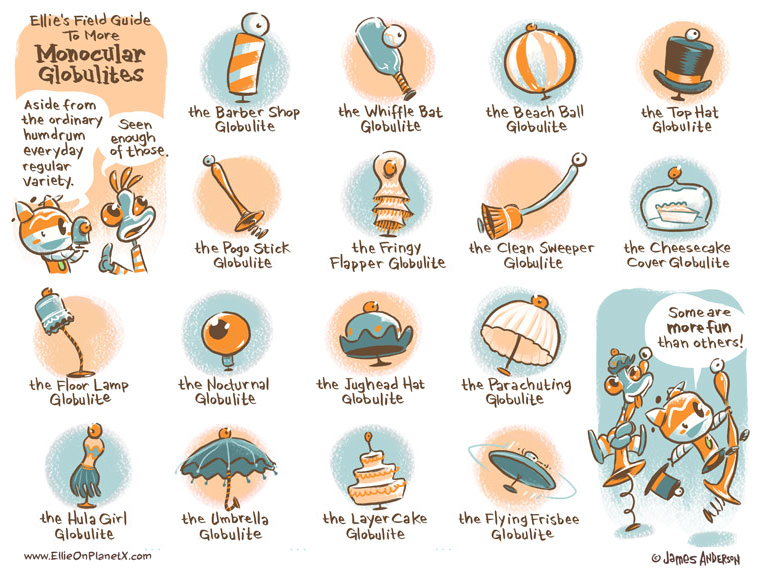 Or what IS the correct term for a roomful of monocular globulites? Something alliterative. A garage full of monocular globulites? -facepalm- I got as far as “Jughead Hat” and had to stop, I was laughing too hard. Thanks, Holy Knight! Happy to entertain! i love all the kitschy life forms she meets!